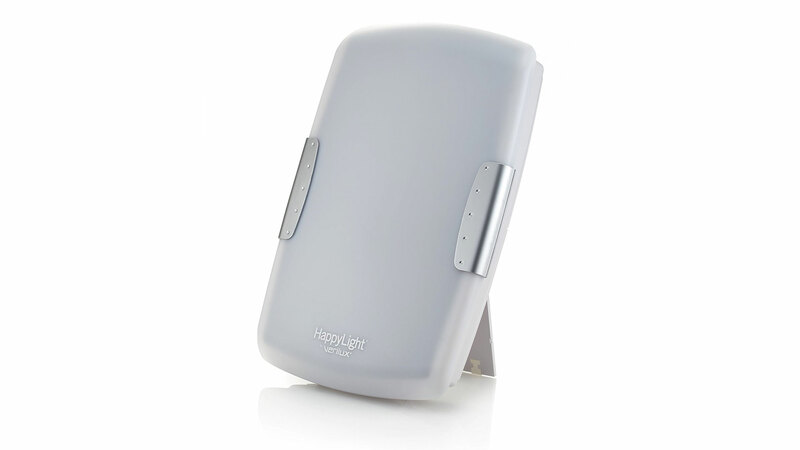 Want to buy the Verilux HappyLight Deluxe 10,000 Lux Sunshine Simulator? 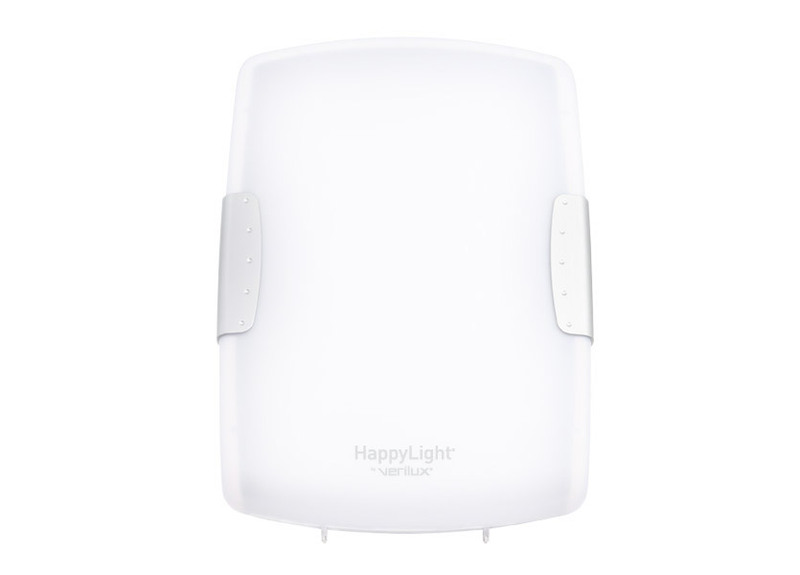 There is no doubt that the Verilux HappyLight Deluxe is a quality SAD light, it has one of the largest surface areas of light of any SAD light, but it is expensive and lacks features, which is why it loses a few marks. If you decide you want to get the Verilux HappyLight Deluxe, see where you can get the best price. Bulbs: Two 36-watt Natural Spectrum fluorescent bulbs. Switch: On top of lamp; On/Off. 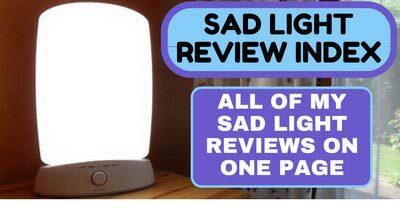 It is pretty straightforward, but it is always best to test your sensitivity to light therapy if you have never owned a SAD light before. To do this place it 18 inches from your face and turn it on. Make sure the light is not shining directly into your eyes. Leave it for ten minutes and turn it off if any discomfort is felt. If you feel ok, increase the time and decrease the distance from your face. Essentially ease yourself into it slowly. 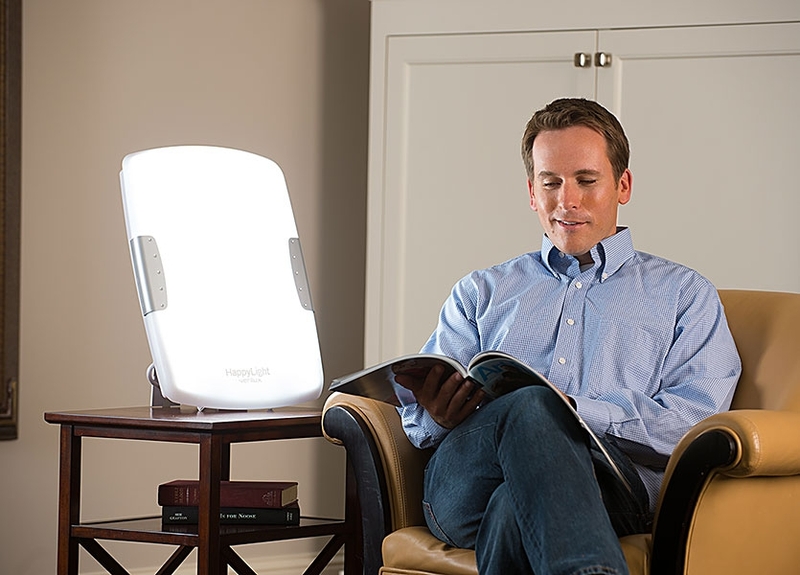 As long as you aren’t feeling any ill effects you can start light therapy sessions in earnest. To get the best out of the HappyLight Deluxe you are advised to have it 6 to 18 inches from your face, slightly offset from the centre (again make sure you don’t look directly into it). Switch it on and make sure you are always in the field of light. Then do whatever you want – read, write, use your tablet, sew, etc, etc – for 30 minutes to an hour. 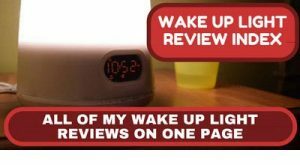 Repeat each morning (light therapy is always most effective in the morning) and most people see their SAD symptoms diminish. It uses two 36 watt fluorescent bulbs that are designed to last 10,000 hours and has a lens diffuser that reduces glare and eye fatigue. The Verilux HappyLight is large! Very large. As much as you prepare yourself you might be surprised by how big it is. In fact it is a foot and a half high, so safe to say it is not a subtle device! However this means it kicks out maximum light and has a wide shine pattern. You can move around the lamp with a high degree of freedom before losing exposure. This gives it a huge advantage over other smaller lights. The surface cover the light comes from is intelligently designed – instead of just being flat it is slight rounded. This means the light is released all around the light, not just in a forward direction, so you can walk to the left or right of the light and still get light exposure. This is another useful feature that is quite unusual in SAD lights. I like the colour of this light, for me it is pretty close to the sun’s spectrum at the time of day in the summer when it is brightest. The light output is around 6500K, which actually seems to exceed that of the sun and it has an effect of making it seem like daytime in your room even in the middle of the night. It is incredibly easy to use. Basically buy the light, plug it in, make sure it faces you, turn it on and after 30 to 60 minutes turn it off. The light is strong and doesn’t flicker, it turns on immediately and generates no noise or heat when it is running. It is as simple as that. The HappyLight Deluxe is well made and sturdy. 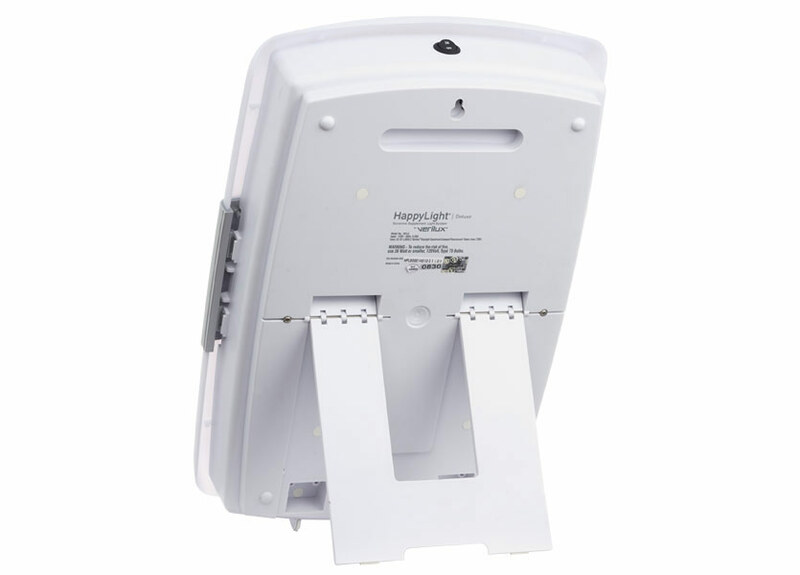 It has a stand which stores flat against the back, that locks into place with a clicking mechanism, and allows you to adjust the angle of the light. Due to the quality of the build and its size it is unlikely to be knocked over, even if you live with children and pets! Despite its size it is easy to move around as it has a carry handle on top of it – so you can move it from room to room depending upon where you want to station yourself. Lets make no bones about it – the Verilux HappyLight Deluxe is expensive. It is at the top end of the price range when it comes to SAD lights. For the price it doesn’t necessarily have all the features you would expect. There is no timer, no variable light intensity and whilst you can adjust the angle of the light, it doesn’t have the same flexibility as say the Day-Light Classic or Day-Light Sky. I mentioned in the pros that this is large, which means it is great if you want a wide field of light. However if you are looking for a SAD light you can put on a bedside table or in a small space, then this isn’t for you. You need to have quite a large area to place it in, so be aware of this before you purchase. Many users have reported problems with the ballast/bulbs burning out, which it seems it is a fairly common occurrence. Verilux generally have excellent customer service and will sort this, but you could be without a SAD light for a while. Also please note that if a fuse burns out they are internal so unlike most high-energy ballasts they cannot be replace. It also weighs in at 7lbs which makes this one of the heavier SAD lights on the market. There aren’t really a huge number of downsides, but the main one is the price and the lack of features for a relatively high price mark. If you have the money to spend I’d recommend you go for either of the Carex Health Brand models – the Day-Light Classic Plus or Day-Light Sky or the Verilux HappyLight Liberty 10,000 lux, top quality lights at comparable or even cheaper prices. I quite like the look of the HappyLight Deluxe. It is smooth, sleek and streamlined. However one thing it isn’t is discreet – as I mentioned it is large, verging on the gigantic – it measures 19 inches high by 14 inches wide. So if you are trying to keep your Seasonal Affective Disorder a secret, this probably will give it away! As with most SAD lamps it works. One user says it is wonderful and rejuvenates them in the afternoon at their low point. Another who had used it daily for 12 years said they cannot recommend a product more highly. Someone else called it awesome and the general consensus is that it lifts your mood and energy levels, leaving you feeling less moody and with more drive. Verilux have a great brand reputation when it comes to making SAD lights and this maintains that reputation, but it loses marks as it is expensive and doesn’t have any extra features to make up for the high price tag. It is large and generates lots of light though, which is a good thing, however it lacks the angling options of the Day-Light Sky and Day-Light Classic. 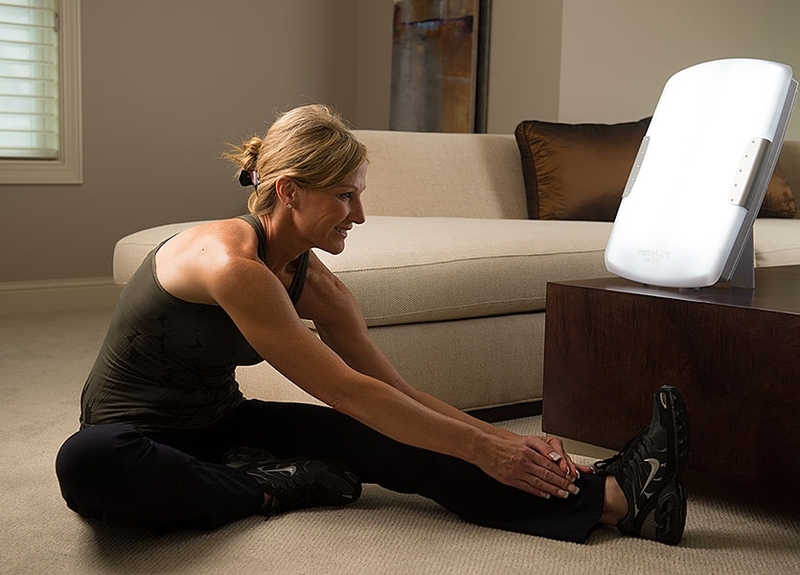 It has been well made, is really easy to use and it is nice that due to its size you can comfortably get your dose of light therapy and not worry about moving out of the field of light. However if you are looking at getting a Verilux SAD Light I would always recommend the HappyLight Liberty. This product is actually pretty cool. I kind of thought of these things as silly when I first heard about them, but they actually make a lot of sense. I definitely don’t get enough sunlight during the winter and this would probably be a better investment than having to repeatedly buy vitamin D supplements. Do you know how much vitamin D you get in one session? Thanks for the comment Daniel. 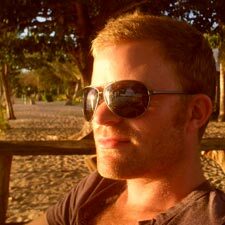 SAD Lights do not produce Vitamin D – as you say you will need to buy Vitamin D supplements for that – they are however medically proven to improve your mood and make you feel better. They do this as the bright light mimics sunlight that is missing in the darker winter months and this in turn sends nerve signals to the brain which then produces serotonin which helps improve things such as your mood and appetite.